A poignant letter from Kolli Hills! 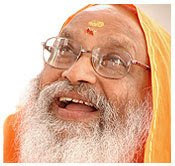 Following is an e-mail update from Swami Paramananda-ji in Kolli Hills, TN, with news worthy of celebration, and the painstaking work that goes behind it. A single kind "anonymous" donor from Houston contributed $15,000 towards the construction of the 2nd floor of this chAtrAlayA in the year 2005. In our ashram, we are having 50 boys and 50 girls who are orphans, very poor and mainly Kolli Hills tribal. They appeared for the 8th standard public exam. This year Thenmozhi, a tribal student, topped the district with a score of 419 out of 500. All 28 students who appeared passed. Earlier, they were all school drop-outs. Many scored very good marks now. Hence the student home changed their life and future. We are planning to educate them further as much as they want to study. We have three gentlemen and three ladies as teachers. They go to villages to get these children. I also sometimes go with them. Many times it involves walking for miles. It is difficult to convince the parents and children. It is not easy to talk with them. Once they join at an average age of 9, we have to teach them from the scratch. The teachers have done a good job. We can double the strength as per the sponsorship we get now onwards. It is really a great feast to see happiness of those children who passed. They came to me with some toffees to share their joy. Hence I thought to share with those who are inclined and supported and potential well wishers.